November Blahs and a Giveaway! November is not my favourite time of year. I find it’s generally a transition month. That nowhere month when it’s technically still fall, but it sure doesn’t feel like it. There is snow on the ground, a decided chill in the air and it feels like winter. That time between Thanksgiving and Christmas, at least here in the middle of the Canadian prairies, where you’re busy digging out the winter coats, boats and snow shovels, and trying to acclimatize. So, let’s brighten things up a bit! Where do you like to go for a quick getaway? Someplace far or near, you retreat to when you need a change of scenery? 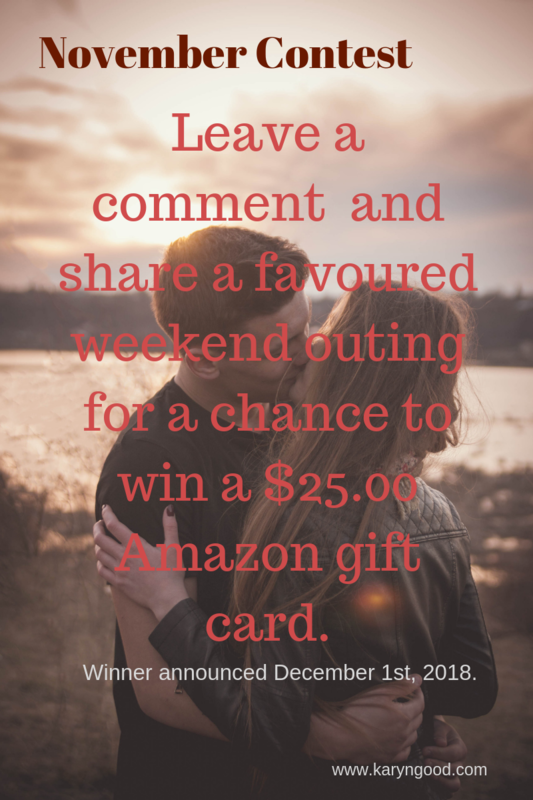 Staycation or vacation, tell us your spot to unwind and be entered in a chance to win a $25.00 Amazon gift card! Also, starting Tuesdays at the end of November I’ll be giving away a prize pack each week for four weeks to celebrate the holidays! Likewise, good things coming to Newsletter subscribers in December, so sign up and join in the fun! This entry was posted in Giveaway, Uncategorized and tagged Giveaway, Karyn Good, November, Romantic Suspense Author by Karyn Good. Bookmark the permalink. Winter has arrived here, Karyn – with wind gusts to 80k/h making it feel like -15. Add in the wet weather, it is bitter. I much prefer a dry, Prairie winter 😉 We are fans of staycations – with Yoko Ono Days called first thing in the morning. Pyjamas and bed, books, maybe a movie, definitely popcorn, no computer. There’s something magical that happens – we are rested, content. Just the right amount of time away from the world to re-energize. Sounds wonderful, Janet! I would take that kind of staycation any day. I’ll take shovelling our dry snow (which I actually enjoy doing, believe it or not!) over your wet, heavy snow. Speaking of retreats, writing retreats are a fabulous way to warm up November. We had a great time together and I think most of us were pretty productive. We definitely missed you! Thanks, Jana! I definitely missed being there. A writing retreat is a fabulous way to leave the normal world behind and immerse yourself in creativity and laughter. I imagine there was plenty to that too! I go far away and walk the streets and discover new neighbourhoods in places where I do not understand the language. Or at least it used to be that way, now many places have English as a language many students learn. Often when I attempt to speak their language, Portuguese, French, Greek, or Italian they will soon find their English is the way to communicate. My preference now is a moderate temperature rather than heat. And I prefer urban settings to ocean walks. People inspire me. Hello, World Traveller! Some day I’ll get to some of those places you mention, although I suspect I’m not quite the fan of travelling that you are. I’m glad you find inspiration everywhere, that’s what makes you just a great writer! Also, I’ll take to those ocean walks any day of the week! Yes, Hawaii! I love it there! It’s the perfect blend of everything. Add in books and drinks, and it’s perfection. Hope you’ll be visiting this paradise soon! The trail to Bertha Falls in Waterton Lakes National Park. We were there two weeks ago and I was almost floating along the trail. It was quiet, the trail was in pretty good shape, and through the burned trees I could see the lake. I could feel my mind calm, my mood lift, and I was humming. It’s such a beautiful place, and it’s in Canada! Sound beautiful and peaceful. Not gonna lie, I’d like to be on a trail by a lake today taking in the scenery and working on being present. I like Victoria, BC, in Canada for an easygoing weekend getaway. For me, Karen, my favorite is going on a cruise with family. My parents, my sister, my husband and I try to do one each year, and they are so relaxing and invigorating! I especially like the fact that they are all inclusive. Once you’ve paid, you don’t have to buy anything else — although usually we do end up with a few purchases. It sounds like a low-stress way to travel, Ruth! As well as a great way to see the world! Enjoy you’re next ocean vogage!